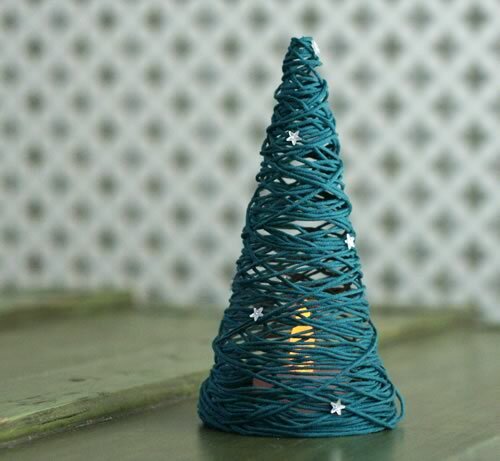 These cone-shaped miniature Christmas tree ornaments will look stunning on a table setting or mantlepiece. They're made out of string and homemade starch, and they're super easy to make! 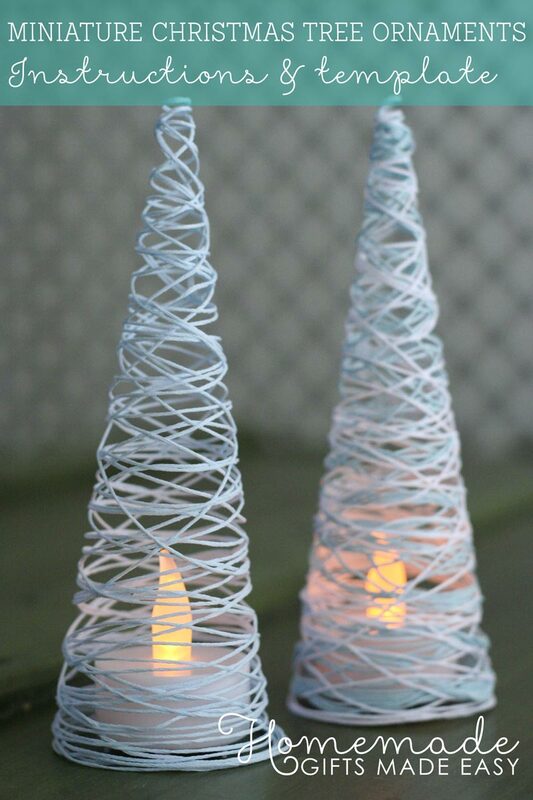 I absolutely love these little decorations, they are so festive but still minimalist which I really like. They are fragile though, so not great when you have curious little people in the house who want to "take a look"! In the USA Sta-Flo is a popular brand of liquid starch that you can find in Walmart. In the UK you can find "fabric stiffener" at John Lewis, which is basically the same as liquid starch. I first tried this project using white glue (Mod Podge) instead of starch. Big mistake! The string was so firmly stuck to the cling-film covered cone mold that I couldn't get it off. If you still really want to try using white glue, then I'd recommend covering your cling-film in petroleum jelly (vaseline) before you wrap the string around it, so that the string comes off later. 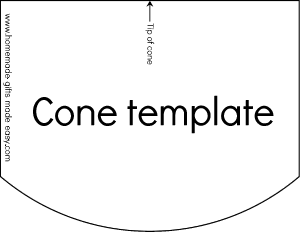 Download the free cone template. Cut out the template. To assemble, fold one straight edge to the center-line (line up with the "tip of cone" arrow), and then roll the rest of the way. Secure in place with tape. You can vary the tightness of the roll to obtain different-width cones. 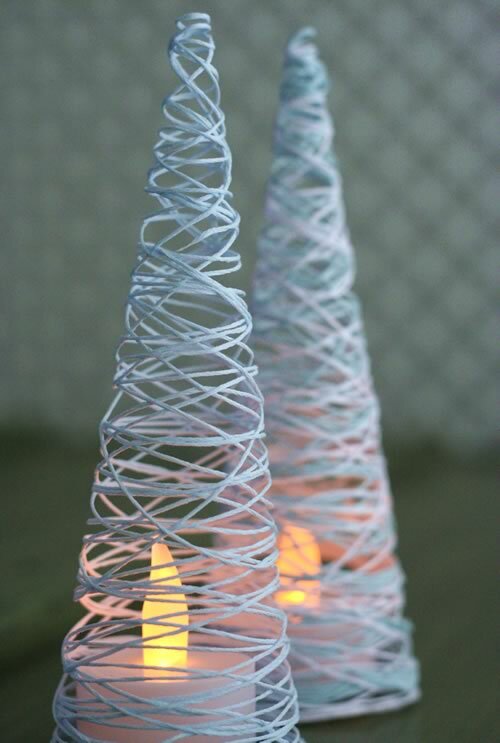 To prevent your template from going soggy, wrap a layer of cling-film tightly over the surface of the cone. Tuck any excess inside the bottom of the mold. 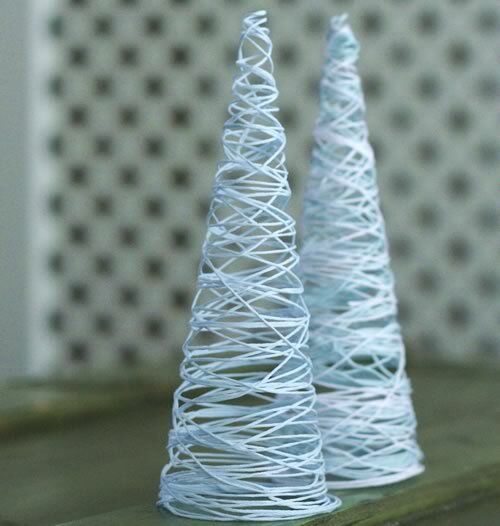 Probably the most difficult aspect of making these string trees is working out the best way to soak your string in starch so it doesn't all tangle up ! Sit your ball of yarn in an empty container (yes, that is a tissue box!) so it can unravel at a tug, but won't roll all over the table! 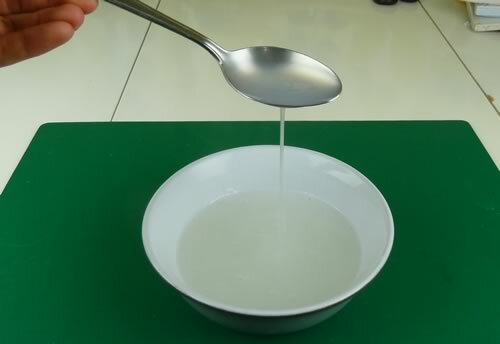 From there, the loose string can be pulled into the bowl of starch mixture in a manageable quantity. 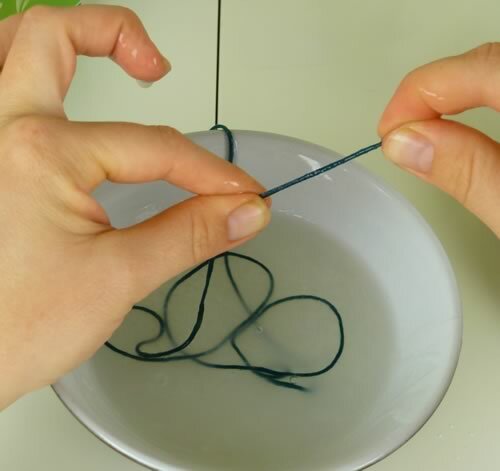 If you're working with embroidery floss skeins, we found that having the loop of floss around one wrist, from which you can unwind a small amount at a time to soak in the starch, works very well. Once well-soaked in starch, it is important to gently wipe off excess starch from the string before you wind it onto the cone mold. Don't squeeze all the starch out though... you want to leave enough to make the string stiff when it dries. Wrap the string firmly around the cone mold. Initially make a few tight wrappings around the tip of the cone. This will secure the end of the string in place so your string decoration won't unravel easily. Once the end is secured, wrap the soaked string up and down around the mold in a random fashion until you're happy with the density of coverage. Leave to air-dry overnight in a warm room. 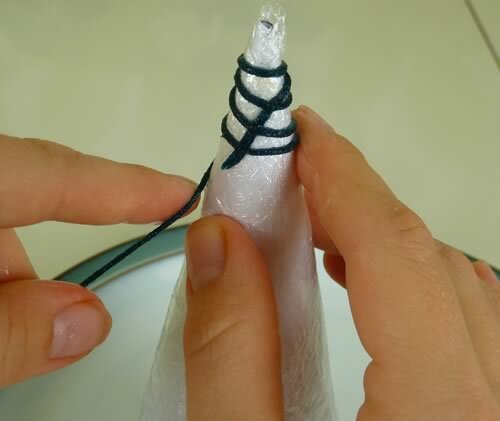 Once your starch-soaked string is completely dry, it is time to remove the cone mold. Pull out the tucked-in cling-film and first remove the paper cone from the inside. Then you'll find it is very easy to tug on and remove the layer of cling film. Do be gentle at this stage as the ornament is fragile! And here is the finished string-tree! Isn't it pretty! 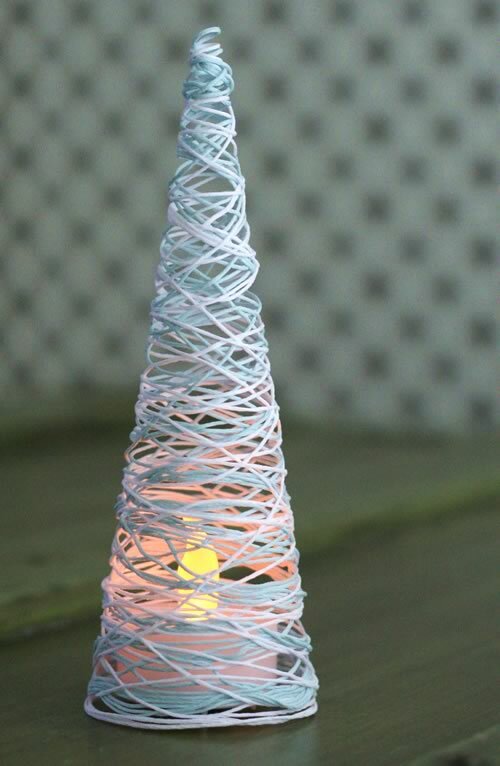 You can embellish your trees with adhesive diamantes or other sparkles. I think a light dusting of glitter would look fabulous too! I like to use an electric tea-light candle under each tree ornament and sit them around the house over the festive season. 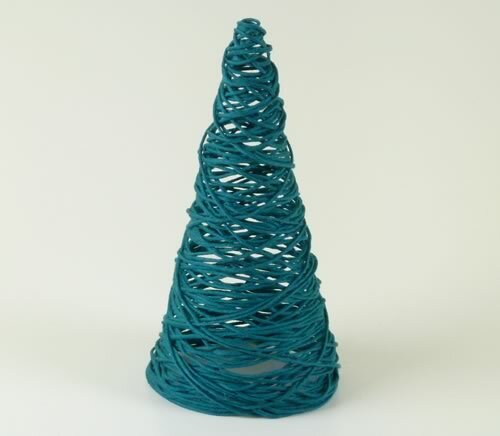 If you want your tree to be taller and narrower, wind your cone template tightly to obtain a narrower cone mold. You can also use multiple colored threads. Here I've used white and pale blue embroidery floss (about 9 yards (8 m) of each). Remember that the color you wind onto the string tree mold first will be the colour that is underneath (in this case, blue then white over the top), so think about which colour you'd like to be more visible before you start wrapping. You can also vary how much string you use. For the tree in the foreground, I've used just one skein (9 yards/8 m) of embroidery floss. The tree is fragile (I have to keep it out of reach of my curious toddler!) but looks *so* incredibly beautiful. And again, it is lovely to display the trees with a bit of lighting from electric tea-light candles.